Walter worked at Orvis in Manchester, Vermont from 1994-2000 and began his fly fishing guiding career on the Battenkill. After earning his B.S. in Environmental Studies from Southern Vermont College in 2000, he dabbled in the corporate world after graduation, but found his way back to fly fishing and guiding. He traveled west to California. While working as a flyfishing guide at Truckee River Outfitters, Walter attended the Clear Water Guide school on the banks of Hat Creek in Northern California. The stunning artwork displayed throughout the lodge brought back those artistic inspirations of early years. In 2005, Walter moved to Park City, Utah with his wife Andrea and worked as a full time guide at Trout Bum 2. In 2012, he started his own outfitter Park City Trout Tales. He remembered those art pieces displayed at Clear Water Lodge and felt an eagerness to get back into drawing and painting fish again. He bought a set of colored pencils and drawing paper from the local art store. ​ Thinking he was taking on a pastime or old hobby again, his fly fishing clients suggested otherwise. They took notice of his work, began requesting commissioned pieces of trout caught on past trips and started buying prints. 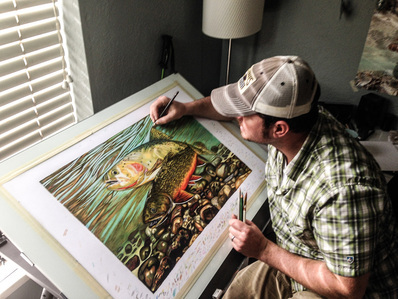 Suddenly, Park City Trout Tales spun a second business, Fine Fin Art.